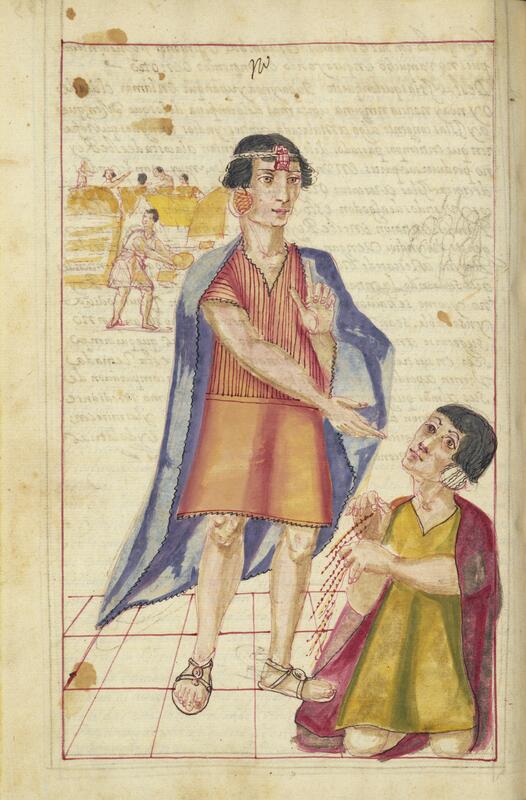 This hand-painted manuscript image focuses upon the Sapa Inka, Tupac Yupanqui. 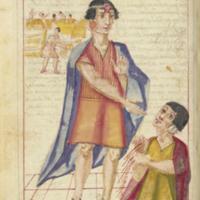 In this image, the king stands with fingers pointed in a gesture of oration or speech, and converses with the khipucamayoc, or reader of a khipu, at his feet (a variant spelling of the term is used by the Getty Museum, and thus appears in the title). Behind him a building project unfolds. This is one of several royal portraits created for the General History of Peru, or Historia general del Piru, a manuscript project of the Mercedarian friar, Martín de Murúa. This figure represents the Sapa Inka, Tupac Yupanqui. He ruled the Inka empire in the late 15th century, and according to some post-conquest writers, was responsible for developing Inka imperial laws and expanding the empire northward. He wears a red-fringed headdress, the mascapaycha, which could only be worn by the Sapa Inka in pre-Hispanic times. The kneeling man is a courtly khipucaymaoc, or khipu-reader. While essential to the empire, his lower status is made clear through his physical position, below the Sapa Inka, and in the simple decoration of his tunic. The knotted cord he holds is a khipu, a record-keeping device used in the Andes for millennia. The Inka seem to have adopted it from earlier pre-Hispanic people, and it is still used in the Andes today. Two khipu can be seen in Vistas. The images in the General History of Peru, orHistoria general del Piru,were probably created by a workshop of painters, one of whom was Felipe Guaman Poma de Ayala, an Andean man famous for his own 17th-century account and images of Perú, theNew Chronicle and Good Government.Martín de Murúa, who wrote the text of this manuscript and commissioned its images, was a Mercedarian friar, who worked in the Viceroyalty of Perú. This is one of several manuscripts concerning the Andean past he created in the 17th century. This image is painted with watercolors on imported European paper. Some of the paints were mineral-based, others were derived from organic sources like cochineal and indigo. As a scene from Inka antiquity, the image could not have been painted from life. Yet the clothing in several of Murúa’s images is quite similar to actual tunics from the 16th century that have survived to the present. This suggests the indigenous painter may have been working with examples of such clothing in front of him. This unpublished manuscript of Murúa’s seems to have been created for the King of Spain, Philip III. Like many manuscripts from the Americas, once in Europe it fell victim to international events. Early in the 19th century, the document was seized by French troops when Napoleon Bonaparte’s men invaded Spain. It then became property of the Duke of Wellington when he defeated the French in 1814. The manuscript was named after the Duke, as “Wellington Manuscript,” and today, is housed in California in the J. Paul Getty Museum. This painting, which shows the Sapa Inka dressed in a royal tunic and the mascapaycha, uses European painting conventions to recreate a scene from the pre-Hispanic past. The alphabetic text written in Spanish, which bleeds through the painted page, shows another European technique for explaining the Inka to the Spaniards who ruled their descendants. The khipu being “read” by the seated man in the painting not only testifies to ancient Andean modes of record-keeping, it also resonates with those of the colonial period. In the 17th century in the Andes, khipus were still used (and created). Some scholars have suggested that Murúa’s sources included khipucamayocs. If so, this painting describes both the past and the 17th-century method through which Inka history was called forth.